No attorney in view, the restaurant and bakery in Houghton, a local tradition, is the Suomi. (pronounced Sue Me) *. The bearded busboy, a student at Finlandia University, is very polite, yet appears a raccoon with distemper. The no-nonsense waitresses, so quick you feel their passing breeze lift the napkin from the counter; the French toast made from freshly baked cinnamon bread, exquisite. This is Paris, in denim, hiding from polyester vacations. Since our first visit to the Keweenauw, 2008, the entire peninsula has become more vibrant. Calumet and sister city, Laurium, on the verge of extinction, are now in resuscitation. Not hip or trendy, i.e. disney, cruise ship, water park, cookie-cutter franchises. Tourism, home-grown small business, renewed historical interest in mining, and the abundance of natural beauty trump Priceline.com or Sandals® resorts. Credit the Pure Michigan campaign. The entertainment choices, like most university towns, are often unique. The Festa Italiana in Hancock boasted its headliner, “The World’s First Indestructible Italian Polka Band”, but ran out of spaghetti, overwhelmed by hungry festival goers. The Michigan Tech Pep Band is reputed to be a techno-geek sensation, but sadly, we arrived a month prior to practice. 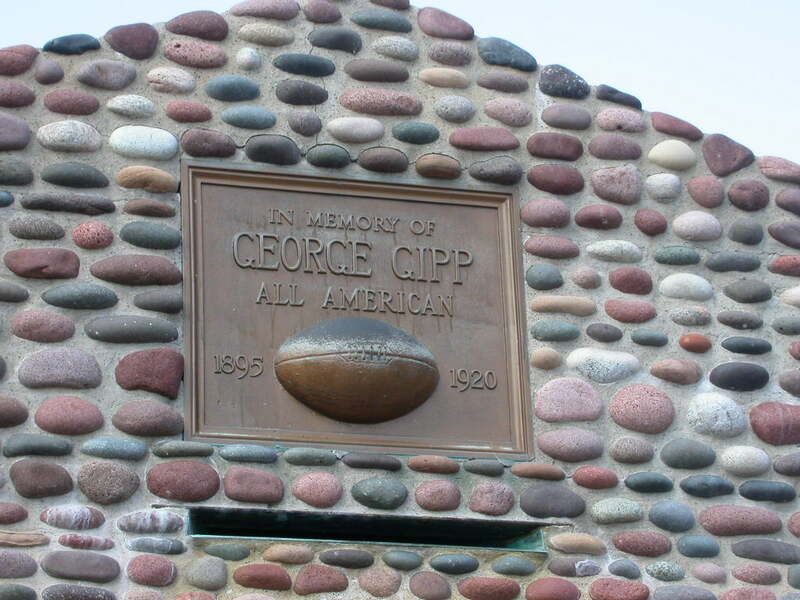 Laurium’s own, George Gipp, immortalized on the football field and in fieldstone by Knute Rockne and Ronald Reagan. 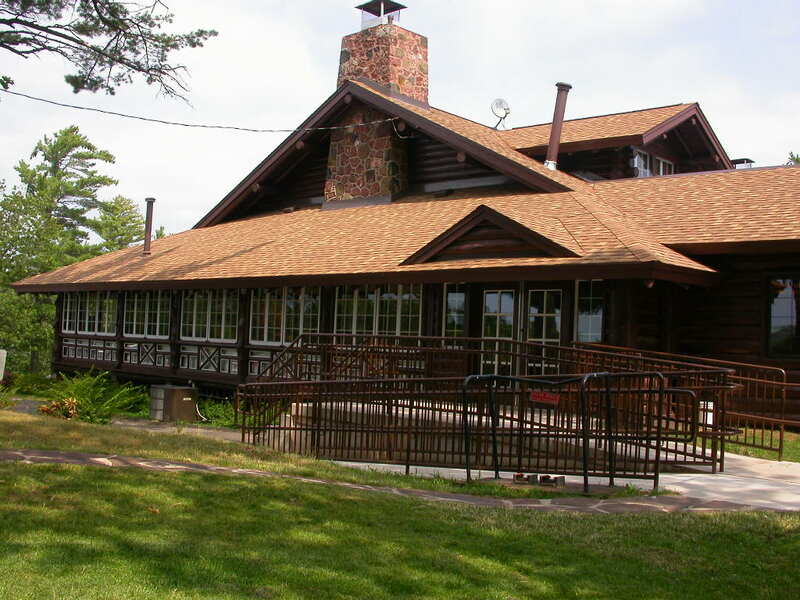 The lodge of the Keweenauw Resort, built in the early 1930’s has changed little in eighty years. Built by the WPA to provide labor for the 80-90% unemployment among miners, it retains the craftsmans’ unduplicated charm to this day. A baked haddock sandwich, cole slaw, chips and beer never tasted better. Nearing our goal, the Copper Harbor lighthouse from across Horseshoe Bay as seen August 2008. A beautiful, lonely, desolate finger into the teeth of northwest winds of Lake Superior. August, 2014, same view, Lynn explaining to Mrs. Wilson our first visit with Jack. We’ve reached our goal, the genesis of U.S.41. Family portrait; and a vow to one another we won’t wait 6 years to return. This is where snowfall is measured in feet, not inches. Where people think hockey is an actual sport although admit never seeing the puck. And most important, the natives regard the current frenzy, the ice bucket challenge**, as a thermal joke. They wouldn’t consider participating unless they needed to warm up. **when will this ever end ? 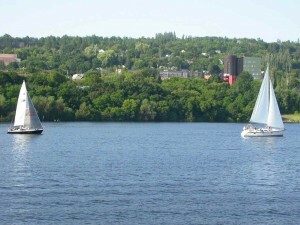 The approach to Houghton, MI., along the Portage Lake Channel is attractive, not breathtaking. 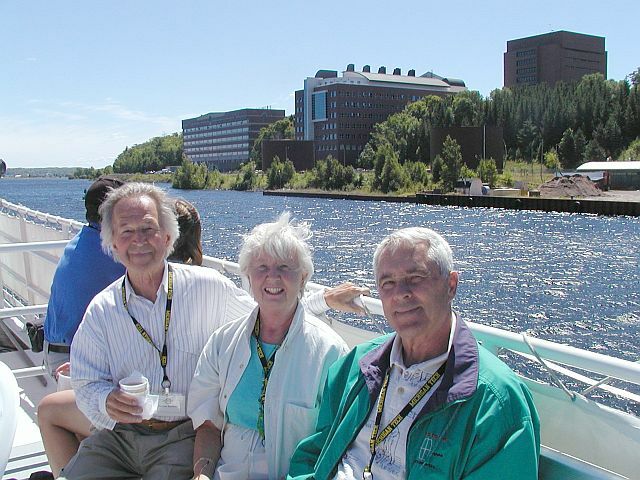 However, the anticipation of a week on the shore of the Keweenaw peninsula is pure oxygen. HQ of the copper boom lasting a century from 1845-1945, it is now home to the famed engineering Michigan Technical University (formerly Mi. School of Mines) with a noted alumnus, Julie Estep PhD, the prominent rhetorician. Ms. Estep quietly manages to avoid the public limelight in Chico, CA., along with her husband, Gary, and four dogs. Add Norman Rautiola, now living in splendor, Montecito, CA, inventor of patented keyless entry into automobiles. 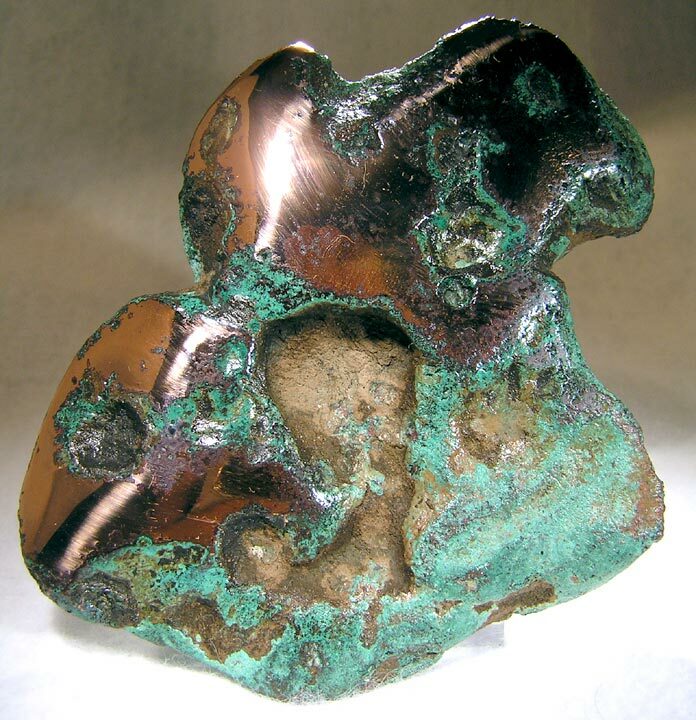 He also developed the electromagnetic field which senses your approach and opens/closes doors and windows. Being the nation’s electronic valet became profitable, which Mr. Rautiola generously shares, in addition to his time and business savvy, with MTU. In the future, sooner than imaginable, we’ll be traveling in driverless vehicles. Rest assured, his Nartron Corp. will own the patent. 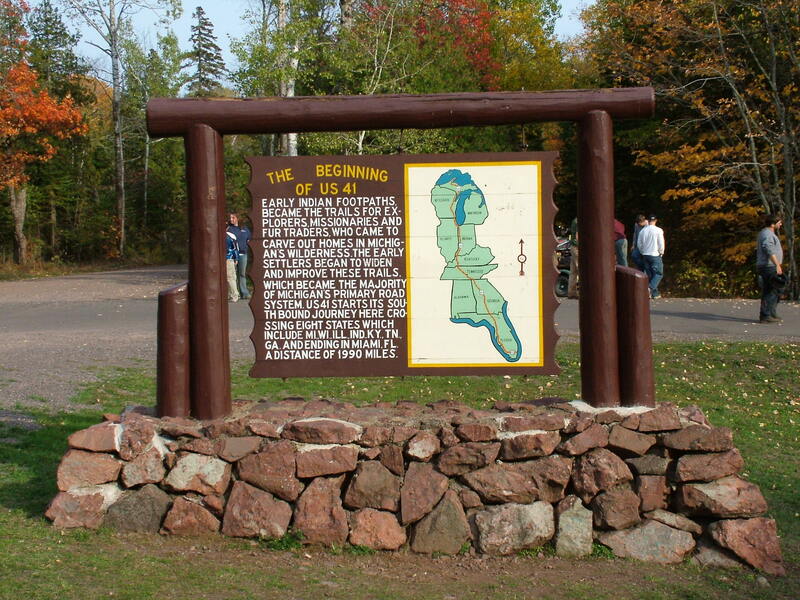 Unlike California, the planetary prune, which continues the unsustainable siphoning of the Colorado River, the Keweenaw is surrounded on three sides by Lake Superior, the deepest and largest supply of fresh water in the hemisphere. Quoting* Garrison Keillor ” the purgatory of lutefisk, a repulsive gelatinous fishlike dish that tasted of soap and gave off an odor that would gag a goat….not edible by normal people. It is reminiscent of the afterbirth of a dog or the world’s largest chunk of phlegm”. Lutefisk may have been solely responsible for the noticeable Lutheran inbreeding of Swedes and Finns. Who knows? What is important is that humans are all hybrids, just like our dogs, and you have to wonder…why can’t we get along? Tribal battles flourish. In northern Iraq, the Sunnis slaughter the Kurds. In northern Michigan, factions of the Chippewa, Sault, Ojibwa tribes engage in turf battles for casino revenues. Everybody is a loser….prisons prosper; substance abuse and depression become the fast track industries. A solution might be to have warring factions spend a winter together, sharing firewood, skis, lutefisk, and ice fishing huts. Population growth here remains at zero. No surprise when most activity, in or out of doors, revolves around ice. Californians may be proud of their tan lines, being on a first name basis with cosmetic surgeons, or thankful their homes have not been incinerated in a wildfire or on a mudslide headed for the beach. No such problem in Houghton, as the natives have an unlimited supply of water to wash and wax the snowmobile in anticipation of another birth controlled winter. We, thankfully, plan a perfect summer week in the community owned waterfront RV park. The array of local activities has us mouthing at the frost. 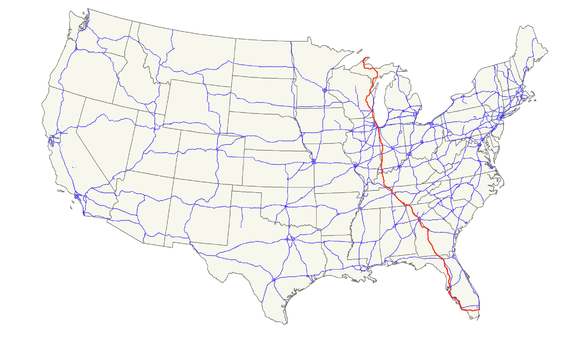 Apology to the lyricist of “Ramblin’ Man”, we’re on US 41, imagining the early 1950s before Ike and the interstate system. This road is a north/south noodle, perpendicular to the overly glamorized Route 66. Having grown up less than a mile from 41, and only minutes from the view of Lake Michigan’s southern tip, this old highway is a mess; potholes, so deep, the water drains into the South China Sea, or at the least, burns a hole in your patience. From the Indian Reservation in L’Anse, Michigan to the southern terminus in Miami, the most disgusting city north of Havana, the road is a life sentence with little punctuation. Perhaps an apostrophe for NFL fans in Green Bay, but little else. Highway tedium in search of a mood detector. Anxiety, depression, and aggression beg for the release of serotonin, unavailable from the Walgreen’s or CVS that litter the highway. 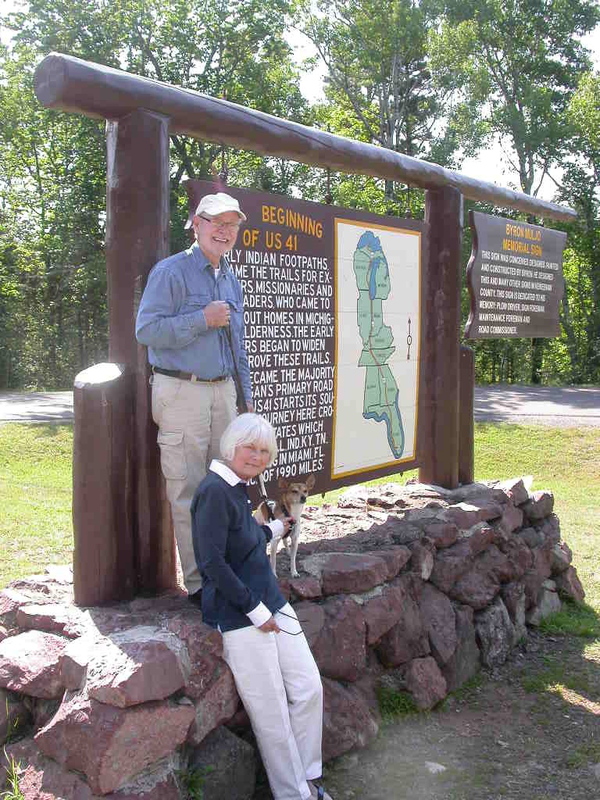 Headed north in Baraga County to the starting line in Copper Harbor, MI., however, is a traveler’s dream: 79 miles forward and 79 years backward in time. 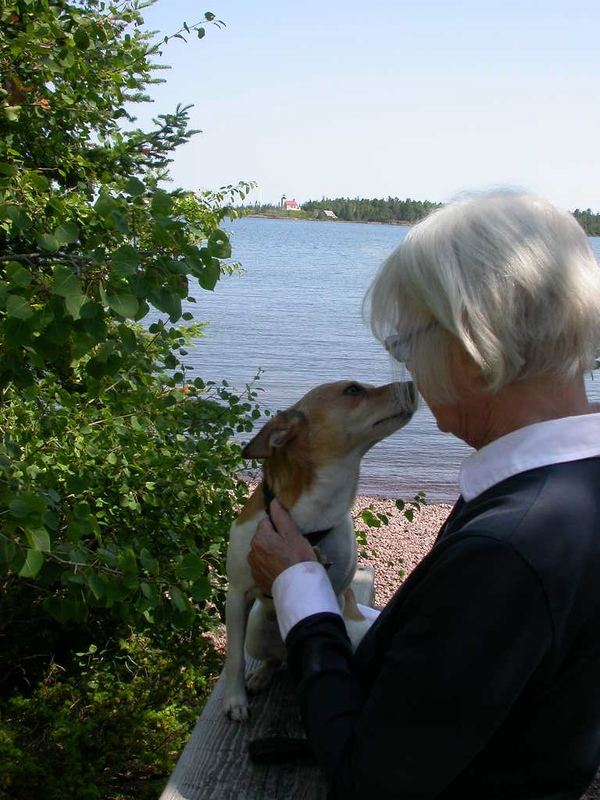 Copper Harbor is in a time warp; souvenir shops with local items made of cedar, the departure dock to Isle Royale N.P., and the ubiquitous physical adventure travelers. Helmeted. You recognize them, shrink wrapped like colorful sausages, wearing plastic cycling shoes. They drive an aging Volvo station wagon with kayaks on the roof and mountain bikes on the trap door. Bumper stickers; Dukakis/Bentsen in 88, Greenpeace, ‘ I brake for mountain goats’. With temples beginning to grey, each armed with a personal electronic device, they leave behind the fingerprints of apps, the footprints of consciousness. No one has told them the news. We’re not ‘riding the dog’, as the title might imply. This is the first non-medical trip in five years, the Excella awakened from slumber and performing flawlessly, taking a vacation from retirement. Think of it as a 30 year old Airstream on a Medicare Advantage plan. 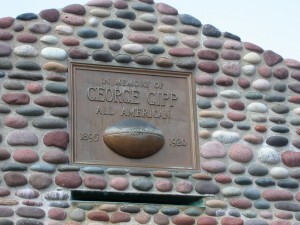 A stop for a nap in Champion, MI., pop. 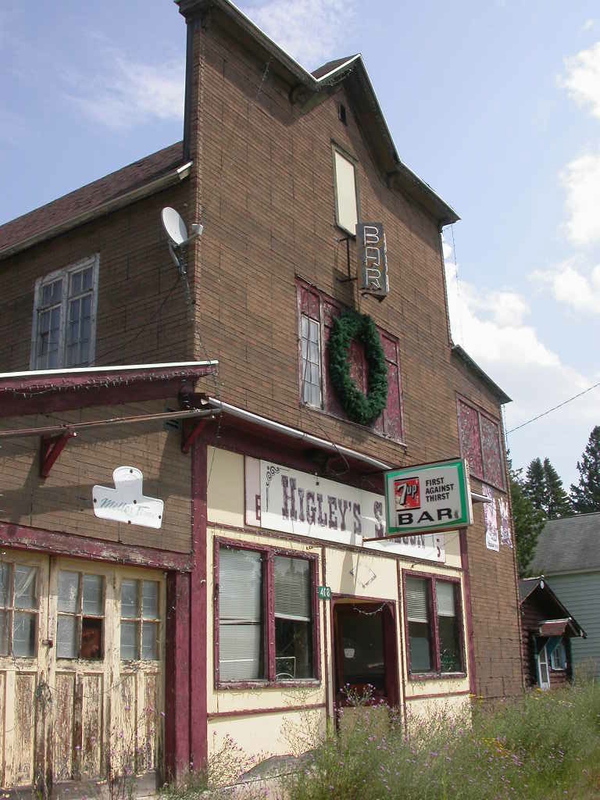 297, is a highlight, the horse-pull capital of the Upper Peninsula. 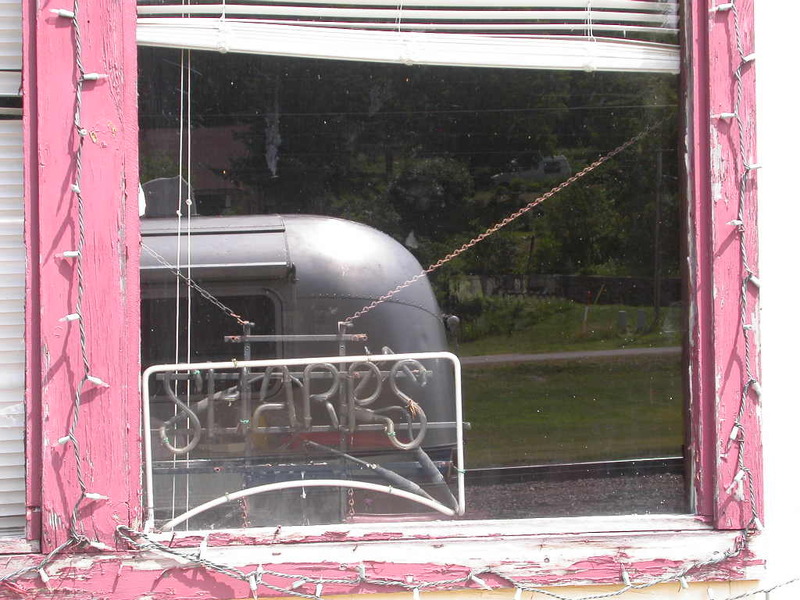 The only saloon, featuring a sign, both neon and alcohol-free, was closed years ago. The maple trees are tinged with yellow and red…fall arrives early north of 46º. Headed north to Houghton, at 45 rpm, we’re off to tell Tchaikovsky the news…….